The ethnic Chinese jewelry designer Anna Hu had presented the latest jewelry series in 2010. That is Turandot series that caught the eyes from international jewelry collectors and fans. In Turandot Series jewelry, you can well feel traditional and classic styles. Turandot is an opera that tells a Chinese legendary story that imagined by a westerner. The love story makes Anna Hu use her art talent to make symbolic jewelry. The princess image in Turandot is embodied by green, azure blue and red and black colors to mould. In the design, they are in accordance with designs trend and to be used curved lines to express Art Deco features. 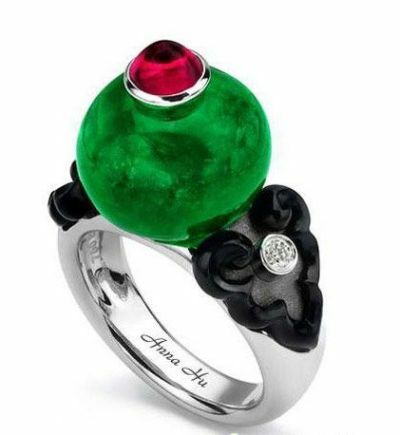 For instance, the delicate ring of Turandot is in the traditional design, while it does more stylish on its center emerald design. The emerald is polished into a oval shape and there is a small hole in it so as to inlay a tiny ruby. The green and red colors make a gorgeous effect and it also can make you in shiny gloss.